Inadequate storage is an issue for many people. When a home becomes overly cluttered, it can be difficult to live in the space. Stress levels can rise, and arguments begin to center on how to make the home more livable and to deal with an excess of personal property. Many people find that they reach a breaking point, and the solution lies in renting a storage space. Having a safe and professionally managed storage option can make a house far easier to live in, and can reduce stress among family members. However, having to load things into a storage space is often a challenge, especially when the space is not climate controlled or not located close to home. A great solution is available in the form of portable storage, where the containers come to you and are then delivered back to the storage facility. Anyone who has rented a storage space knows how frustrating it is to have to load and unload the space. 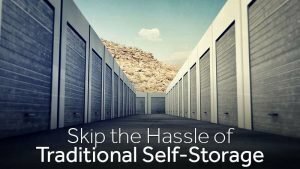 In many cases, the storage unit is located far from work or home, and driving to the location is time-consuming. With portable storage services, the container is delivered right to your door, and then removed and transported to the storage facility when you are ready. That means that you are free to load or unload the container whenever your schedule allows, rather than trying to handle the job in one short burst. Being able to take your time means the ability to pack your belongings in a manner that is safe and secure. That can reduce the risk of breakage or other damage to your property. Many belongings can be damaged by exposure to extreme temperatures. To protect against weather-related losses, finding climate controlled self-storage solution is important. Most on-site, traditional storage units are not climate controlled, so the temperatures inside can fluctuate. 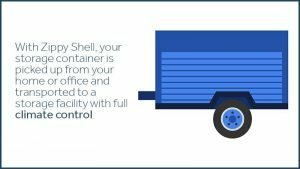 With Zippy Shell, your storage container is picked up from your home or office and transported to a storage facility with full climate control. Our facilities are also incredibly safe and secure. 24-hour monitoring helps you to know that your belongings are just as safe with us as they are with you. What If I Need Something Out Of Storage? With Zippy Shell, putting additional items into or removing items from your storage container is simple and easy. Just call us to schedule a time for the unit to be brought back to your location, and then you are free to retrieve items, add more things or simply reorganize. We then return to move the container back to our storage facility. We also offer free re-deliveries for every six months in storage, which allows you to switch out your seasonal items, such as snow blowers and lawn mowers. You can always call and give us 24-hour notice and we will give you access to your storage container with no charge. At Zippy Shell, we understand that you are entrusting us with your cherished belongings, and we do not take that lightly. We are here to make your life easier, and to facilitate cleaning out cluttered areas of your home so you can produce a more livable and enjoyable space. Please feel free to contact us with any questions or concerns, or to request a free quote. When you are ready to get started, we are ready to be of service!